I love this granola for several reasons; it offers something different by not being oat-based, it doesn’t contain any added oils (gets all its healthful fats from whole foods), it’s a delectable combination of crunchy and chewy, and it captures all the flavors of autumn. Enjoy! A “Touch” Of Honey… And A Whole Lot More! 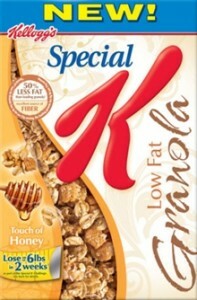 One of Kellogg’s newest products is its Special-K low-fat granola. I came across it for the first time in the supermarket today and got such a kick out of its misleading advertising that I must share it with you. I don’t know about you, but when I hear that something is sweetened with a “touch of honey”, I assume honey is the only sweetener used (and used in low amounts, no less). 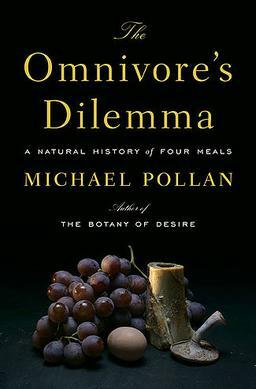 Whole grain oats, sugar, corn syrup, oat bran, rice, honey, soluble wheat fiber, modified corn starch, soy grits, molasses, corn flour, natural flavor, salt, acacia gum, soy protein isolate, oat fiber, evaporated cane juice, malt flavoring, high fructose corn syrup, niacinamide, reduced iron, BHT (preservative), pyridoxine hydrochloride (vitamin B6), thiamin hydrochloride (vitamin B1), riboflavin (vitamin B2), ascorbic acid (vitamin C), vitamin A palmitate, folic acid, ferrous fumarate, calcium pantothenate, vitamin D, vitamin B12. Sugar, sugar everywhere! There are no less than seven different sweeteners — including honey — in this product. There most certainly is a “touch of honey”, along with a touch of sugar, corn syrup, molasses, evaporated cane juice, malt flavoring, and high fructose corn syrup. The sugar content isn’t anything extravagant (9 grams — or slightly over 2 teaspoons — per 3/4 cup serving), but it’s well beyond a “touch” of sweetness. For what it’s worth, you get the same amount of sugar from a three-quarter-cup serving of Fruity Pebbles! Remember — and I will never tire of saying this — that the use of honey as a sweetener does not make a product healthier, lower in sugar, or less caloric. I had a Starbucks yogurt and fruit parfait this morning. It also has granola. I saw that it has 38 grams of sugar. Is that too much to have at breakfast? What should my maximum intake be for one day? The combination of fruit, granola, and yogurt sounds very healthy. And, with the right ingredients, it can be. However, don’t forget that even healthy food has calories. 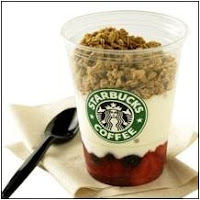 An 8.5 ounce Starbucks yogurt-fruit-granola parfait provides 320 calories and 4 grams of fat. Ironically, a yogurt parfait at McDonald’s is approximately half the size and only provides 160 calories and 2 grams of fat. The 38 grams of sugar you saw noted for this parfait are a little misleading, since that number combines naturally occurring as well as added sugars. As far as healthy intakes are concerned, you only really need to be concerned with added sugars. For example, yogurt naturally has lactose, or milk sugar. Even plain, unflavored yogurt will have approximately 10 or 12 grams of sugar per 8 ounce serving. I suspect these parfaits are made with flavored yogurt, though, which contains added sugar. I would estimate the flavored yogurt is providing 15 grams (or almost 4 teaspoons’ worth) of added sugar. On the bright side, it seems to me that the fruits used in this parfait are fresh, as opposed to sugary jam, so in their case we are also talking about naturally-occurring sugars. If anything, the one ingredient to watch for is granola. 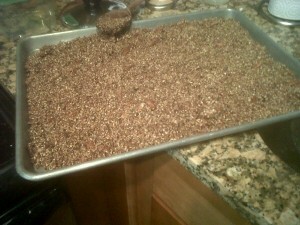 Although it has long been associated with good health and clean living, granola is actually refined grains with sugar. Does that mean you should you avoid it at all costs? No. However, a lot of people seem to believe granola is a health food, which it isn’t. After all, a Starbucks parfait only contributes 1 gram of fiber to your diet. 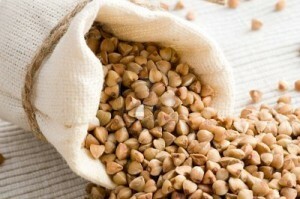 This is not to say that everything you eat needs to be high in fiber. However, don’t make the mistake of thinking that your granola parfait counts as a serving of whole grains. You should aim to have no more than 40 grams of added sugar a day. There are currently bills floating around Congress that would differentiate natural versus added sugars on food labels, which I think is a wonderful idea. I personally find Starbucks’ and McDonald’s parfaits a bit too sweet for my palate. I prefer to make my own with non-fat Greek yogurt, fresh fruits, uncooked oatmeal, and a tablespoon of flaxseed meal.